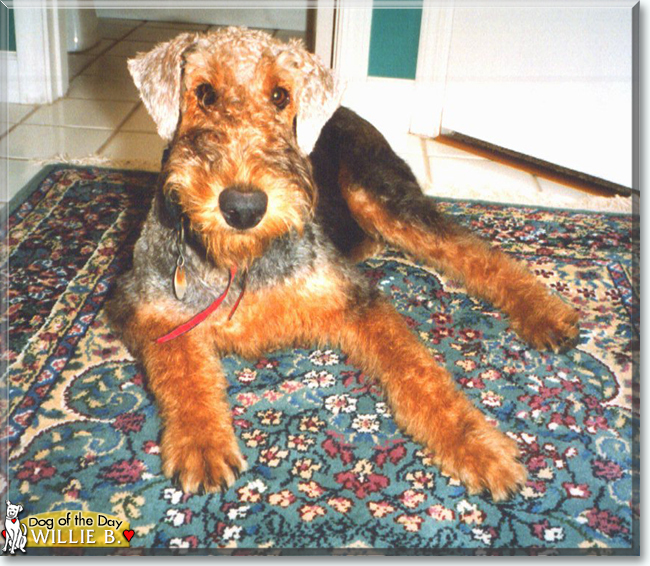 Willie B. is our Airedale who lives with us in Prairieville, Louisiana. Several years ago, Mr. Willie B. made the great escape and, along with his girlfriend and another buddy, harassed some sheep. Mr. Willie thinks everyone loves him, so he was the only dog remaining when the sheriff's deputies arrived at the scene of the alledged crime. Since our parish (that's Louisiana for county) does not operate an animal shelter, Mr. Willie was booked into parish prison. The following day I followed a deputy through the large prison gates that lead to the doggie cell block and you guessed it, I had to "Free Willie." He's was under house arrest after that for quite some time. Apparently, a night behind bars turned his life around. Mr. Willie is also terrified by fireworks. During his first New Year's Eve, he ran away. Three days and two miles later he was located, extremely wet, cold and very happy to see me. Thinking that I could help him work through his fireworks issues, I stayed outside with him the following 4th of July. As the first firecracker sounded, Mr. Willie jumped into our goldfish pond and hid under some giant elephant ears ... what a wuss! I gave up on therapy, we just give him sleepy-time cocktails now if there are going to be fireworks. There's never a dull moment with Mr. Willie. He's such a clown and we truly enjoy his antics. Oh, I didn't mention it, but this 70-pound tail-less fur-ball thinks he is a lap dog! Talk about Willie B. in Pet Talk!